Ursula Huws is a pioneer in documenting and interpreting the changes in the role and form of human labour in the era of the Internet and what some have described as the “weightless” economy. Whatever changes in working lives that Huws examines, she strives to penetrate all the hype and romanticism about the globalised capitalist economy and show the real processes at work. Her thorough and wide-ranging research demonstrates that the notion of an economy which does not require human labour as the source of value remains as fictitious – and elusive - as it always was. No matter how hi-tech a business may be, workers (from the talented, creative to the unskilled) are needed to add value to the commodities which are produced. This goes for whatever kinds of products or services they may be. In an overview of her own life and work over the last quarter of a century, Huws documents both the objective changes in the global economy and the way these have had a significant impact on workers of all kinds, including herself as a researcher and single-parent. A key essay entitled (cleverly re-phrasing Madonna’s song) “Material World: The Myth of the Weightless Economy” deconstructs the notion that the world as we know it is becoming quite dematerialised, and has no real knowable substance. This view is fashionable not just among the digerati, but is a key plank in the propaganda of New Labour and similar governments because at a stroke it does away with the exploitation of labour power by employers. In an thinly-disguised attack on current government policies, Huws rightly says that “these notions serve to legitimise a new political agenda and set the scene for a new phase of capital accumulation”. Although she is dealing with economic data in a book of modest size, Huws does not shy away from examining the connection between the prevalence - what she calls the “hegemony” - of postmodernist notions. She brings forward a strong critique of the argument that globalisation has enabled the system to overcome its own internal problems of survival and endemic crisis. There is a powerful account of the commodification process, which is the background to the relation between economics and politics in today’s world. Its implications are – especially in the light of what has happened since she wrote her book – deeply disturbing. Instead of a “dematerialisation” of the world economy, Huws argues that precisely the opposite is going on – a tendency towards “commodification, or the transformation of services into material products”. She explains: “This inexorable drive towards the creation of new commodities is perhaps the central drive in the history of capitalism; the physical production of material goods being the simplest way of deriving value from living labour.” Huws shows how the service sector, far from “dematerialising” the economy, has quantified and commodified areas of work which previously were invisible. These were not part of socialised labour or of the circulation of commodity production. Socialisation arises and develops directly from both the labour process itself, in that more and more people in different parts of the world co-operate in producing, distributing and marketing the same commodities. Through new forms of communication such as the Internet, contact between them can be virtually instantaneous, regardless of distance. Huws demonstrates how intellectual labour, just like physical labour, is subject to the most ruthless exploitation. No sector, she shows, is immune from the logic of commodification – which leads to a mind-set where even a local government-run bereavement counselling service is viewed from a “value for money” standpoint. Inseparable from this commodification process is the standardisation of labour during the 1990s and a new international division of labour associated with it. The development of computing technology has made it possible for this information to be digitised and for some aspects of its processing to be automated. At the same time, telecommunications technology has allowed this information to be transmitted with great rapidity and at very low cost. “These technologies in combination,” Huws explains, “have made it possible for many of these processes to be standardised, as a result of which it has become possible for the workers to be monitored by results, and for the task to be relocated to any point on the globe where the right infrastructure is available together with a workforce with the appropriate skills.” In one mind-boggling episode she tells how an Australian employer video-monitors his Chinese workforce as they enter data for credit-card companies. Monitoring continues day and night, and the women even bow to the camera for images transmitted to visitors to the firm’s headquarters Down Under. Because the labour process involved in service industries as well as the production of commodities themselves can be quantified, this places workers in different countries on a more equal footing, to the immediate detriment of pay levels in the “advanced” capitalist countries such as the UK, USA and Europe. It also means that the flood of newly affordable hi-tech commodities in these same countries are produced by the super-cheap and super-exploited labour of the newly emerged and still emerging working classes of the Pacific Rim, India and China. Huws asks if the new types of employment will “form the basis of new collective identities”. In general her reply is negative, as she depicts the way in which old forms of collectivity (as well as the straitjackets that accompanied them) have vanished. 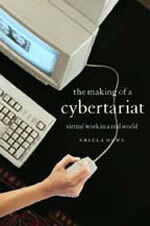 Playing on the Marxist term for the working class (proletariat) she sees the emergence of a new global “cybertariat”. This has brought a potential for “the emergence of a common class consciousness among information-processing workers based in a common labour process, common employers and a common relation to capital” . But she also points to countervailing forces, the greatest of which, she believes, are nationalism and racism. With wit, and illustrating her arguments through many a closely-observed experience drawn from daily life, Huws highlights the stressful, socially-exclusive and alienating nature of the “weightless economy” and how it sets worker against “customer” and vice versa. She does not claim to be able to offer solutions to the problems that she raises. But her study of our “brave new world” sharpens our awareness of the ways in which the development of capitalist-led globalisation has irrevocably changed the lives and thoughts of today’s global workforce.